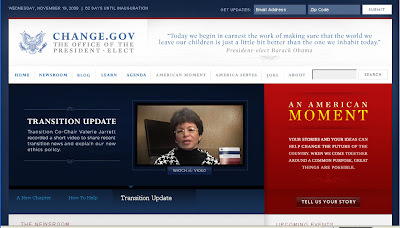 As someone who has been looking at the same basic design at the White House website since the September 11th attacks of 2001, it is with great interest that I have been paging through the online offerings at Change.gov, the website for the transition team of President-Elect Barack Obama. The upcoming administration is also soliciting user-generated content and asking visitors to the site to "Tell Us Your Story" and share concerns and hopes. Of course, opportunist that I am, I couldn't resist filling out the job application on the link at the bottom of the page.